We form an impression of the personality of nearly every person that we meet, see, or hear about. Sometimes we feel anxious. And, sometimes feeling anxious and forming an impression of another person happen at the same time. For example, jurors may feel anxious because of the intimidating environment of a courtroom and in this situation they have to make judgments about a defendant. Is it possible that anxiety will influence how they evaluate the defendant? This book presents a review of theories and research that examine how anxiety can influence people's perceptions of other people. The review notes that when people are anxious they may be more likely to evaluate other people on the basis of stereotypes and/or be more likely to evaluate someone negatively. It then presents a series of five studies examining how anxiety influences impressions of a person who could be stereotyped and/or evaluated negatively. 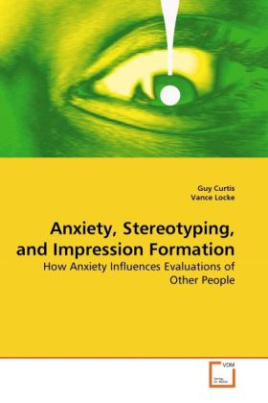 After these studies, a theory of how anxiety may influence stereotyping and impression formation is presented.